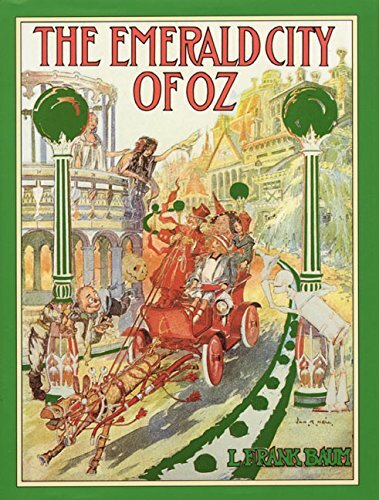 I just finished reading the first chapter in the Emerald City of Oz, by L. Frank Baum. I found several free copies to download and read via a google search. Feedbooks has a nicely formatted pdf version for anyone interested. At some point, we'd like to have the entire series on the oz-stravaganza.com website.
" Perhaps I should admit on the title page that this book is "By L. Frank Baum and his correspondents," for I have used many suggestions conveyed to me in letters from children. Once on a time I really imagined myself "an author of fairy tales," but now I am merely an editor or private secretary for a host of youngsters whose ideas I am requested to weave into the thread of my stories. These ideas are often clever. They are also logical and interesting. So I have used them whenever I could find an opportunity, and it is but just that I acknowledge my indebtedness to my little friends..."
After reading his note, I was eager to get into the story. I was amazed at how little time it took for Baum to implant a wisdom teaching. On the very first page, there was a most beautiful notion that could have been spoken by the Buddha himself. "Why, if you are angry because you want to do magical things and can't, and if you don't want to get angry at all, my advice is not to want to do magical things." While some of you may dismiss this, as the Nome King did, as foolish, this is actually a legitimate thought process proscribed within the Four Noble Truths taught by the Buddha. The particular truth goes something like this, "Dissatisfaction with life arises from desiring to have what cannot be had or desiring to avoid what cannot be avoided." "to destroy the Land of Oz and its magnificent Emerald City, to enslave Princess Ozma and little Dorothy and all the Oz people, and recover his Magic Belt." It seems this will be a tale of vengeance thwarted; or, at least I hope so, for Oz sake! I hope you join me in reading or re-reading this book! Please post a comment and let me know what your thought are!